Our CSA started out small, mostly with leeks, swiss chard and lettuce greens. The very first week I made this frittata with the leeks and chard. It’s so simple and makes a light but satisfying lunch or pairs perfectly with a little salad for dinner. 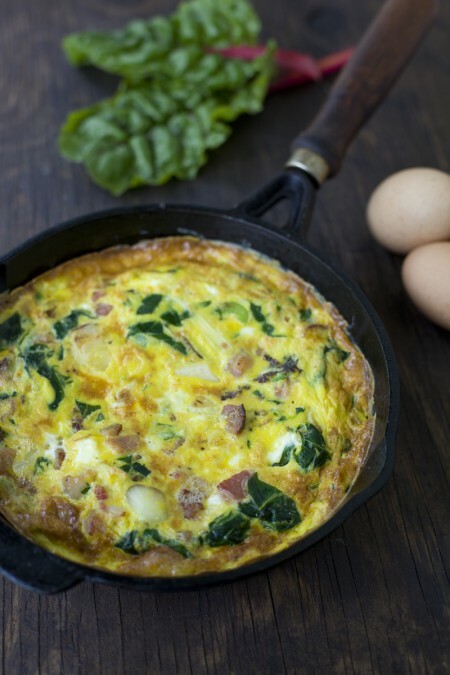 This is such a lovely garden recipe, especially made with farm fresh eggs.What is a frittata you ask? A frittata is an egg based dish. It’s similar to a quiche or an omelet, but it doesn’t have a crust, and the ingredients are mixed in with the eggs. I really like them because the lack of a crust makes it healthier, and there’s no flipping required (which I’ve definitely messed up a few times with omelets!). This frittata recipe is baked in a small casserole dish. But I’ve also made stove top frittatas in a skillet like this asparagus frittata. If you’re in a hurry, and have an oven proof skillet, you can even start your frittata on the stove and let the top half finish cooking under the broiler for a minute or so. Just make sure to watch it closely! This is the first year our CSA farm has done leeks. They planted some last year but it took them a while to grow. The first week they were pretty good, but they’ve gotten pretty woody now that they’re over a year old. I was talking with my friends who own the farm about it last week and they think it’s because they’re older than 10 months, which the seed package says is their harvest time. Not to worry, I’ve been using them in recipes that don’t depend on their texture. For instance, in this recipe I thinly slice them and precook them in a skillet before putting them in the egg mix. That way they get double cooked to help them blend in with the rest of the dish. I’ve also finely chopped them in a food processor to put them in potstickers or spaghetti sauce. So whether you have perfect seasonal leeks, or ones that are a little past their prime, you can definitely make this work. As for chard, you can buy it in the grocery store, but I got 6 chard plants at a local nursery for less than one bunch of chard in the store! I’m so excited to grow it myself. It’s great in my goat cheese swiss chard soup, but sometimes I’ll just put a few leaves torn up in my salad for extra nutrition. Did you know one cup of swiss chard gives you 700% your daily value of vitamin K, over 100% your daily value for Vitamin A and over 50% for Vitamin C? It’s also high in magnesium, potassium, iron and fiber. It’s a superfood! Have you cooked with chard or leeks before? What do you like to do with them? Bring a large pot of water to a boil. While waiting for it to boil, chop the white and light green parts of the leeks, saving the dark green leaves for stock. Heat the bacon fat (or oil) in a pan on medium high and add the chopped leeks. Cook 5 minutes until softened. When your water is boiling, tear the chard leaves into small pieces and put into the water. Blanch (short cook time in boiling water) for 2 minutes and drain. In a large bowl, mix together eggs, milk salt and pepper. Stir in bacon, feta, leeks and chard. 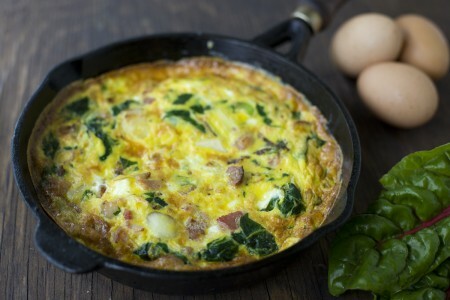 Spray a small square casserole dish or pan with cooking spray and pour your frittata batter in. Cook in the oven 40-50 minutes until golden brown and a knife inserted in the center comes out clean. Approximate cost/serving: This was extremely affordable if you grow the vegetables yourself. I also make my own bacon, and get eggs for $2.50/dozen at a farm. But even if you don’t, it’s still very affordable. Buying everything at the grocery store would make this cost around $5 for me. That’s just $1.25 a serving. We’ll have one serving for lunch on its own, or with a little salad for dinner. Vegetarian/gluten free: You can definitely leave out the bacon to make this meatless, no adjustments needed for gluten free. Hi, Diana! I’ve grown Bright Lights chard and like to cook it like spinach. I fold the leaves in half and rip them free of the thick rib/stem. (You can chop the ribs, freeze them, and use them in soups or stews to add fiber [thanks to Leanne Ely for this tip]). Tear the chard leaves up and put them in a skillet with just the water that clings to them after you wash them. Cook for about 5 minutes on medium heat, stirring frequently. It does shrink a lot, like spinach. Makes a great side dish! I love vinegar, so I add apple cider vinegar and salt to the cooked dish at the table. I prefer this method of cooking to any that include oil or butter. You can also pick fairly young chard leaves, strip them off the ribs as mentioned above, tear into bite-size pieces, and add them to salads. I’ve never had them taste bitter. I love growing Swiss chard because it lasts through the summer (I’m in Oklahoma, zone 7) and doesn’t bolt or become bitter. Thanks for your wonderful website. 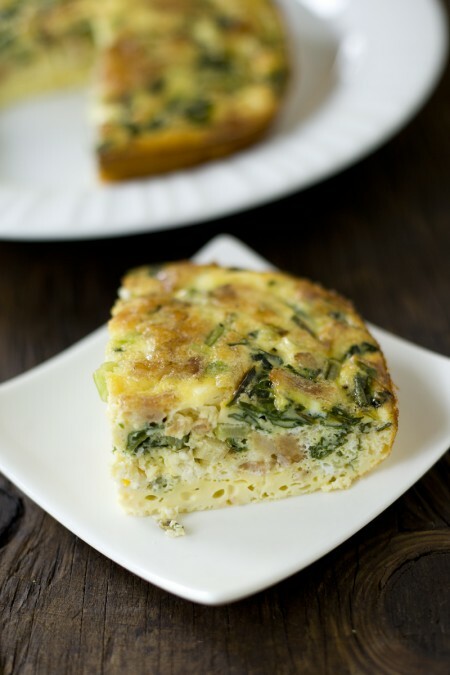 I plan to try the Leek-Chard Frittata soon! Wow, great tips Sue, thanks so much! I frequently get leeks at the food bank. The other clients don’t know what they are and won’t touch them. Among other things, I use them for Potato Leek Soup. That’s a real shoe-in because the food bank often gives out potatoes, buttermilk or cream, and of course the leeks. I am growing Swiss Chard. Some I started from seed earlier this year. I did get one package of chard seedlings. By separating them and allowing them to “grow out” in smaller pots, I was able to turn a 9-cell package into about twice that many good plants. So far I have used the chard to make Lentil/Chard soup (using the greens) and stir fry (using the ribs). It would seem Lentil/Chard soup is a traditional Mediteranian dish. There are dozens of recipies online.